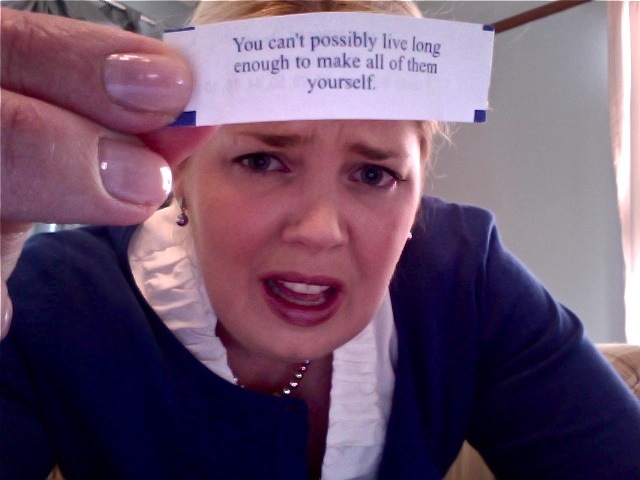 I love to read the fortunes but I give the cookie away. My friends look at me like they are getting away with something but I smile because I’m the one getting away from the white carbs and sugar. I wonder if I should invent the fortune apple? This is exactly what happens to my husband all of the time. And, most recently to me and the lack of blog comments. Thanks for the lol. 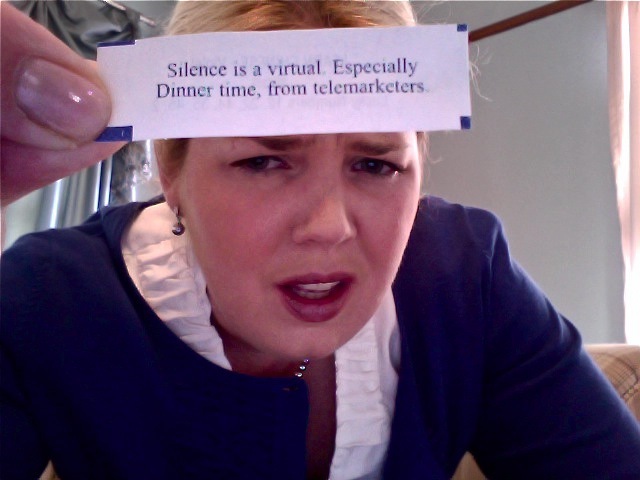 Unless you were in Kenosha, WI when you got that Silence is virtual… well I got it too last night. Also “rely on your own good judgment to lead you to success.” the Chinese word on the back “bing” means disease. I can only conclude this is telling me If I want to be successful stay disease free. Hahaha hilarious! My favorite is the telemarketer one! Thanks, Kat! 🙂 That one was definitely a head-scratcher. But at least it didn’t make me lose sleep at night, ha! 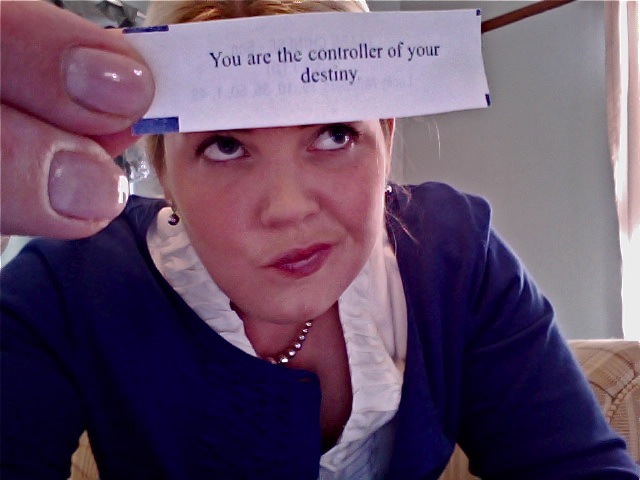 I especially like how you included the facial expression as you show the reader what the fortune reads…funny! Thanks so much, Frances! I tried to capture my actual reactions to those cookies (okay, okay…maybe dramatized just a TAD… ;))! Haha! love the way you put that together. 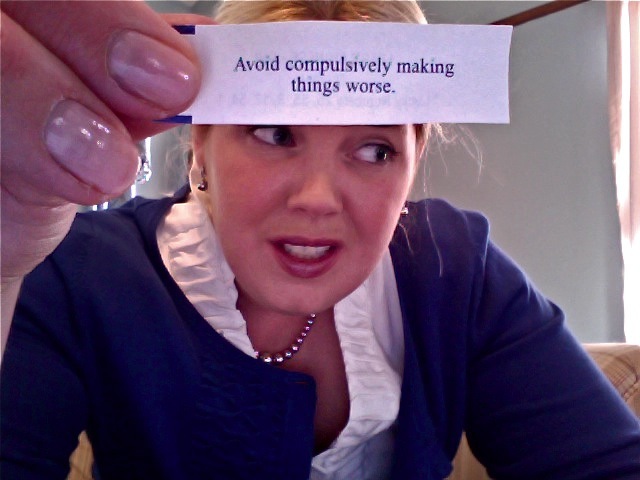 the last fortune cookie would have freaked me out too hahaha. I remembered the other food stuff that gives the gift of written messages… Baci !!! Italian chocolates. They are quite simply the best chocs in the cosmos… and each comes with a wafer-thin piece of paper inscribed with a little message about love !!! Awwwww. What more could a girl want ? I’m surprised there wasn’t a fat joke tucked somewhere in there. Fortune cookies are bastards when it comes to being irresistibly delicious and then poking fun at your weight and making you regret eating them (and perhaps the entire meal and the one from two weeks ago too). Ha! 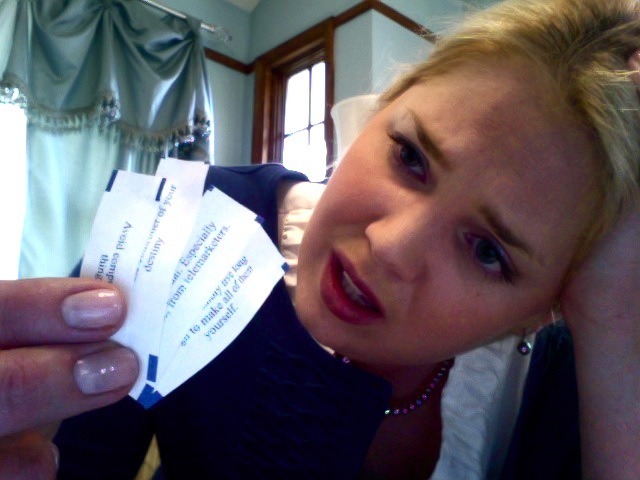 I know if I wrote fortune cookies, I wouldn’t be able to help myself. My goal would be to lead someone straight to the therapist’s chair. Hahahaha! Those samples were scrumptious. You could be quite the cherished marketing tool for therapists and psychiatrists, alike. I’m now not positive where you’re getting your info, however good topic. I must spend some time learning more or figuring out more. Thank you for excellent info I used to be searching for this information for my mission. Thank you for any other magnificent article. Where else may just anyone get that type of information in such an ideal way of writing? I have a presentation next week, and I am on the search for such info. of course like your web site however you have to test the spelling on quite a few of your posts. Many of them are rife with spelling issues and I find it very troublesome to tell the truth then again I’ll certainly come back again. I have got look over lots of information sites in addition to experienced many websites,but your work is in fact brilliant.Caps off for your perseverance in addition to truthfulness.Do continue us advised at a later date too.